Apart from visits by Malaco artists, there weren’t many soul sessions at Muscle Shoals in the 80s sadly. 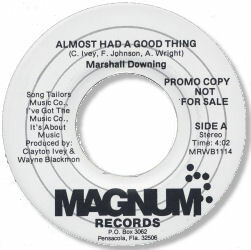 But among the few independent productions the cuts by Marshall Downing are amongst the best. Granted the screaming fire of the 60s was a distant memory by that time, but the subtleties of country soul – melody, open arrangements and vocal care – were still very much in evidence. Downing was a strong voiced singer of considerable skill and his recordings are quality articles. “A song for you” which came out on the GCS label that also released fine material from Peggy Scott & Jo Jo Benson around this time is a well crafted ballad with a beat, but Almost had a good thing is even better. A really good song with a memorable hook is complemented by a horn laden arrangement also featuring some tasty female background vocals. Interestingly a shortened version of the same backing track was also used by a guy called Reggie on his 45 release on Destiny 2004. 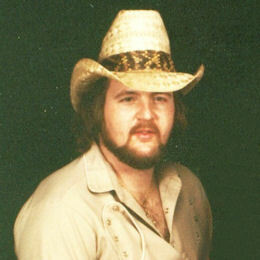 UPDATE ~ "Brute" Brutomesso has written saying that he used to work with Marshall Downing around 1982/3. "Our band was called Country Cookin' and we played five nights a week at a nightclub called the Green Lantern in Pensacola, FL. There was Marshall Downing on lead guitar, "Brute" Bruttomesso on fiddle and harmonica, Fred Mohr on piano (also playing all bass duties with his left hand on a separate keyboard), and Larry Kennedy on drums. The Green Lantern, like most live music clubs in those days, was a very crowded and rowdy place. There were occasions when Marshall would have the entire crowd mesmerized. All chatter would stop and all eyes would be on him, mine included. Now, I'm an old pro, and it takes a hell of a lot to mesmerize me! However, when he cast a particularly powerful spell, I was just as caught up in it as everyone else. We were a Country band, but Marshall had a weakness for Soul Music." Brute says that he doesn't know where Marshall went after that but I'm sure the 45s he cut must have been recorded around that time. I'm very grateful to Brute for his info on this fine singer - and especially so for the photo of him.